It’s an historic day for our nation. America’s first African-American president has been sworn in. 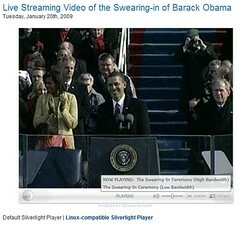 A record-setting two million people attended the inauguration ceremony. And for the first time an astounding number of viewers watched the event via the Internet. This morning my colleagues and I gathered around a computer monitor to see the 44th president of the United States take office. We could have chosen from a number of live streaming broadcasts, but we chose CNN.com‘s coverage of the event, which featured the ground-breaking integration of Facebook statuses. Through the power of the Internet we skipped the lines at inaugural balls, compared the new and former administrations’ open door policies, and shared our thoughts and photos as history was written. Our challenges may be new. The instruments with which we meet them may be new. But those values upon which our success depends — honesty and hard work, courage and fair play, tolerance and curiosity, loyalty and patriotism — these things are old. And that about sums it up. We’re connecting with one another — the most basic of human desires — through new technologies that help us to communicate more quickly and efficiently. Our new administration knows that. Savvy Internet adoption helped Obama get elected in the first place, and the administration will continue to leverage the Internet moving forward. Many of us are looking ahead, optimistic of what the future holds. Take bloggers, for instance. If the newly launched White House blog doesn’t give new-found respect to the title of blogger, I don’t know what will. Update: Over at Mashable, Mark Ghuneim shared some great graphs of social media usage during the inauguration.